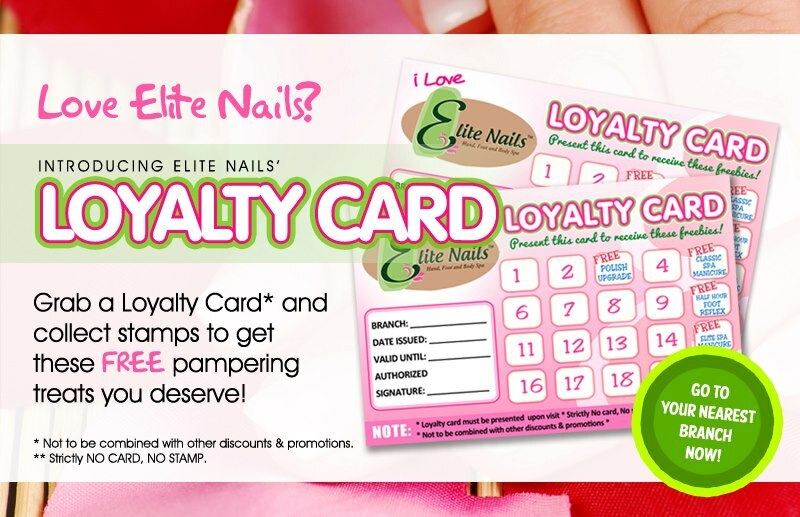 At Elite Nails spa, we value your loyal support and we want to reward you! Each time you visit Elite Nails and avail our services, you will be granted a loyalty card which you can use on your next visits to earn points and eventually entitles you to special freebies and offers. 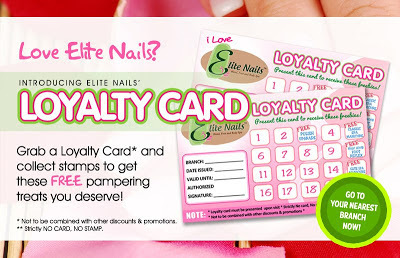 Elite Nails' loyalty card comprises of many exclusive and valuable offers and in order for you to receive all available benefits, it is important that all aspects of the programs are properly complied to. Please take time to visit your favorite Elite Nails spa branch to learn about this latest promotion. This blog will keep you posted as well. You can bookmark this page to get updates or check us out on our Facebook fan page and at Twitter (@eliteNailsSpa) too.